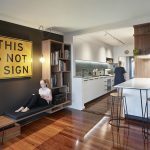 Darren James and Elissa Greer from Darren James Interiors are collaborators on this ongoing redesign and refresh of an eight-year-old Mirvac home for a Brisbane couple. The home is being redesigned in stages. With the lower living area now complete, the interior designers are moving on to phase two: the upstairs bedrooms and bathrooms. 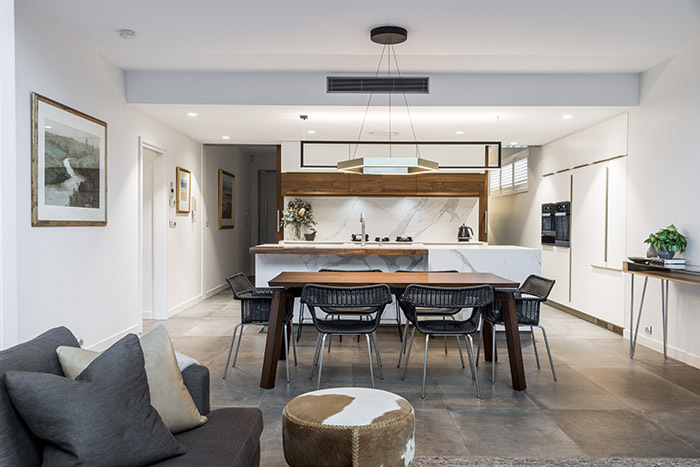 As one of Queensland’s best kitchen designers, it’s little wonder that Darren James Interiors has given the home’s kitchen such a remarkable makeover. 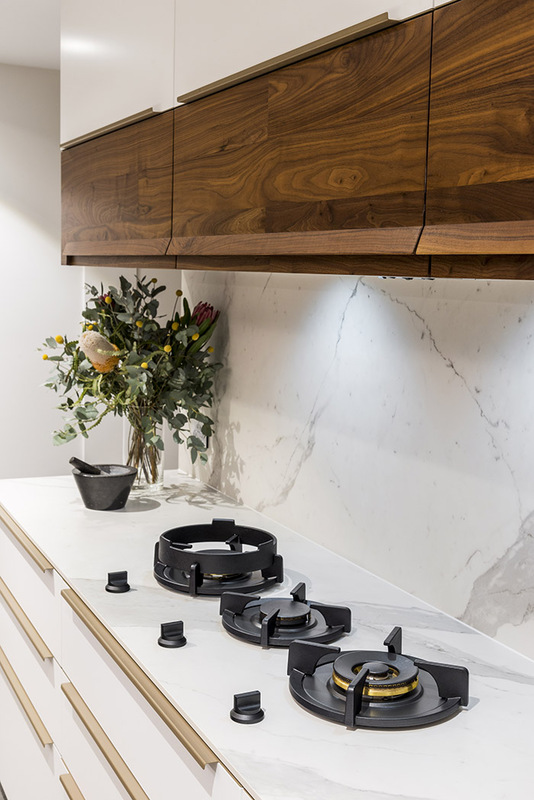 It’s all class, with Laminam Bianco Statuario Venato Soft Touch ceramic slabs from Ace Stone + Tiles for the island cladding, splashback and benchtops. A Pitt cooktop is built into the Laminam benchtop, with an automated 2-pac ‘Pearl White’ satin finish on the fronts. 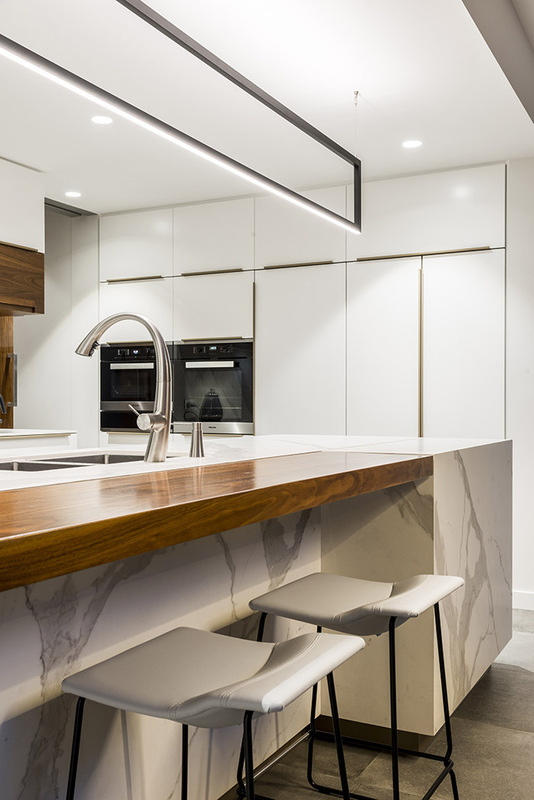 The kitchen boasts luxe additions, including custom folded metal powder-coated handles on all the automotive 2-pac fronts and a custom Walnut profile handle on the solid timber fronts. 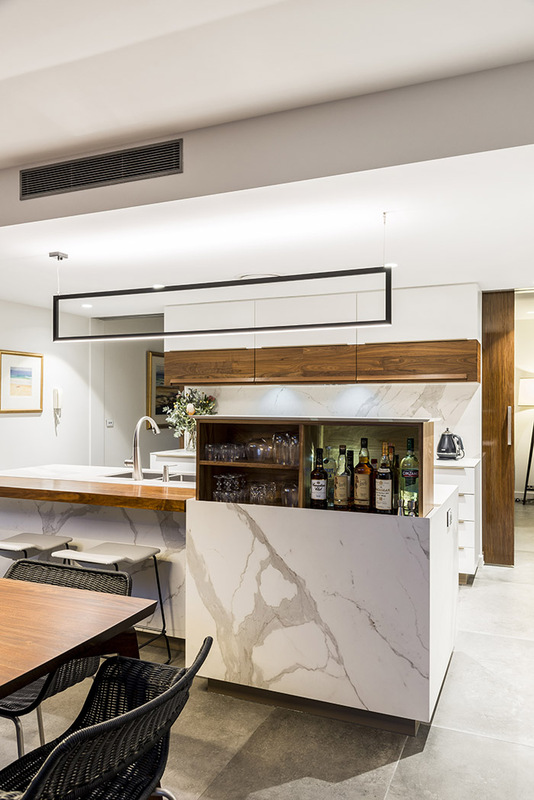 Another nice touch is the disconnected solid Walnut timber servery bench on the island and an electronic lift up liquor cabinet with solid walnut internals. 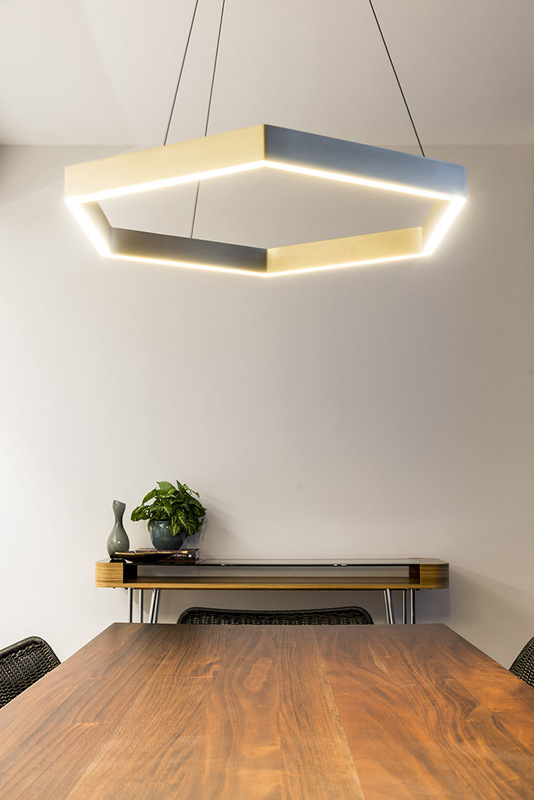 A sculptural Lumen8 H Series pendant light perfectly complements the space. 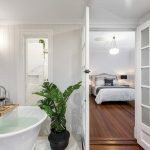 In the living zones, the designers have removed the existing timber floors, replacing it with large tiles for a more contemporary feel. 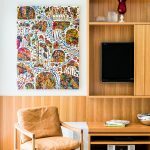 The lounge room has been decorated with a rug from Halcyon Lake, cushions from Jardan and Coco Mojo, and a Canvas + Sasson throw. The Grasshopper lamp by Gubi and tray table by Hay were sourced from Cult. 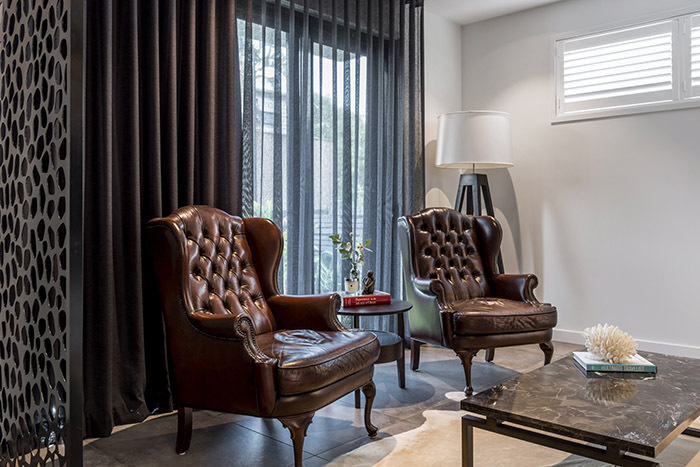 A second, smaller sitting room boasts a coffee table from Boyd Blue, cowhide rug and charcoal linen sheer and blackout blinds. The dining space is equally stylish. 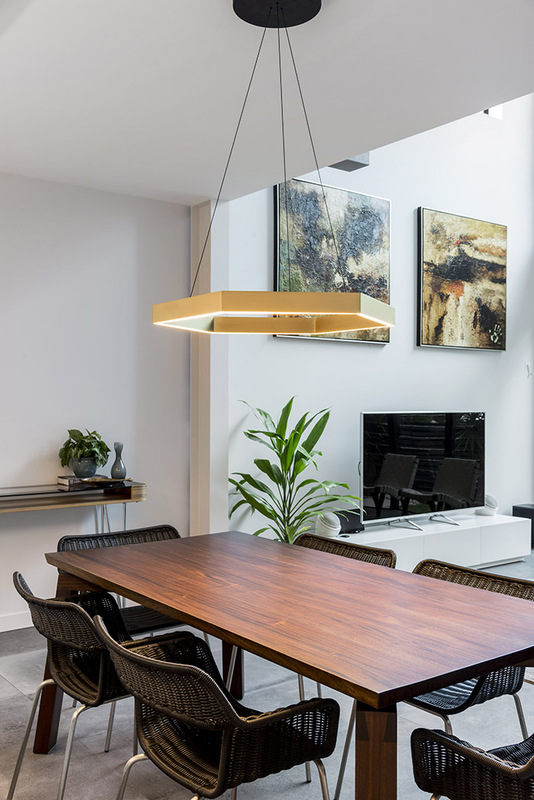 “We refurbished the existing solid timber dining table, which has been re-sanded and stained in a warmer colour to lessen its red mahogany characteristic,” explains Darren. 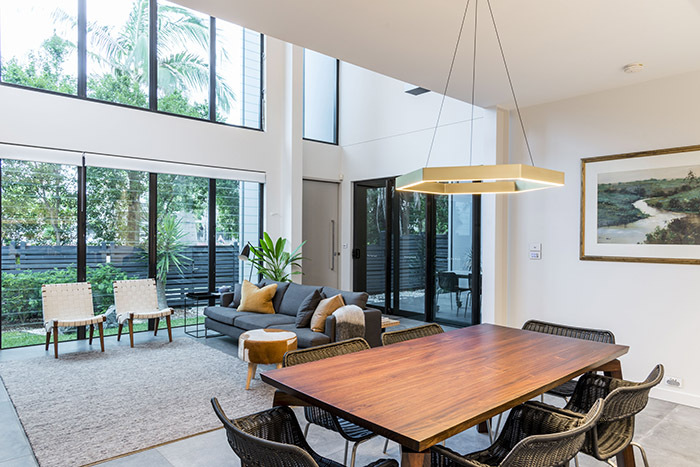 A feature pendant from Rakumba Lighting completes the room. 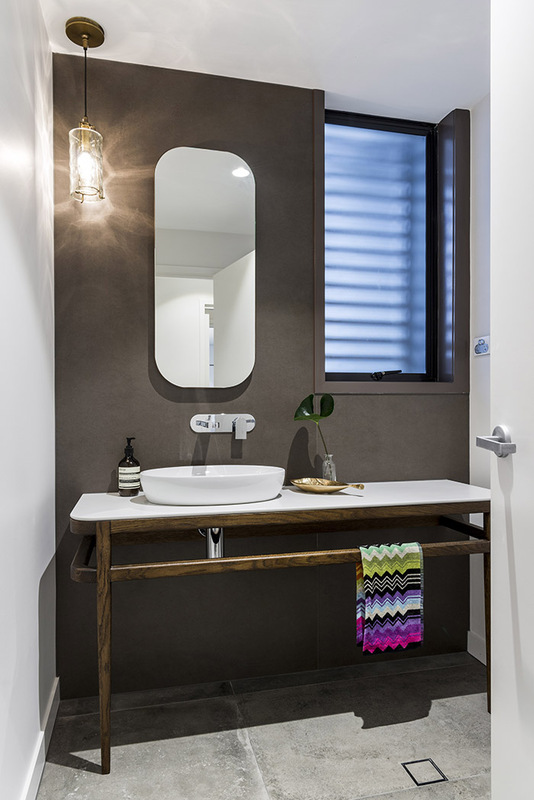 Darren James Interiors has also transformed the laundry and reworked a powder room, which features large wall tiles to offset the chic Issy by Zuster Ballerina vanity and Butterfly mirror from Reece. Classic towels by Missoni finish off the designer look.